In 2006, Nigel Ackland had an accident. Working as a metal smelter a the time, his right hand was crushed in an industrial mixer. The hand was so severely damaged that six months later he was forced to have it amputated. Speaking at Exponential Medicine, Ackland presented himself as an ordinary guy facing an extraordinary challenge—a distinction he shares with millions of fellow amputees. How to put your life back together? Learn to live with your disability? A year after Ackland lost his hand he said he was beset by fits of sudden raging anger. It was hard enough to physically adapt, but he noticed changes in how people treated him too. Strangers would avoid him or stare, with some mixture of pity, fear, or disgust. The guy he saw in the mirror was a physical and mental wreck. Then something happened that changed Ackland’s life. 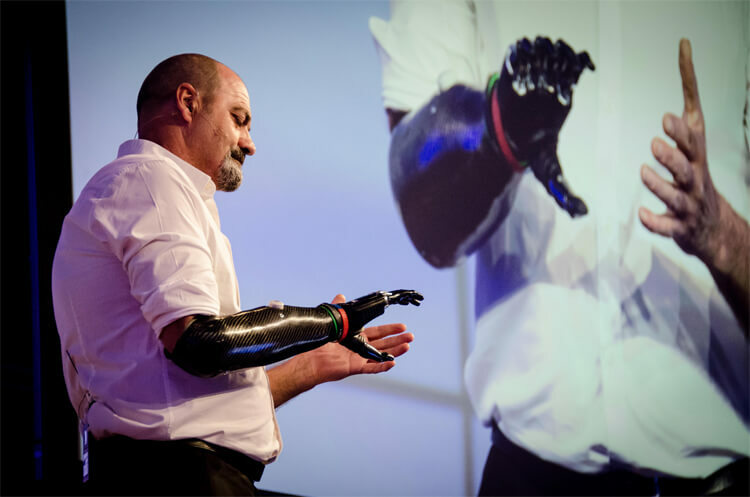 He got a call from RSL Steeper, maker of the bebionic robotic hand. The company asked if he’d be interested in becoming the first amputee to test out their product. Bebionic is a prosthetic hand that myoelectrically senses muscle twitches in an amputee’s stump. Depending on which muscles users twitch, the hand can perform a variety of functional or communicative grip patterns and hand positions. We first wrote about Ackland and his bionic hand back in 2012—when he first began releasing video showing what he could do—and followed up again last year. With practice and experience, Ackland is now a pro. But it isn’t just about the technology itself enables him to do. His life has positively changed pretty much across the board. He says people are more ready to accept him as he is, and of course, are full of curiosity about his bionic hand. They want to shake hands, see what he can do with it. Ackland’s story offers a critical glimpse behind the scenes. The human element is all too often lost in the flush of excitement, in the feverish development of technology. But the point, ultimately, is to help people regain a sense of wholeness. “I’m just an ordinary guy fortunate enough to wear an extraordinary piece of technology,” he says. Ackland told us every thirty seconds someone becomes an amputee. Since he began testing the hand, another twenty people have joined him. And no doubt, the technology can’t come fast enough for everyone else that could benefit. Encouragingly, the technology continues to develop. We’ve covered a number of prosthetic limbs—arms and legs—that intelligently respond to a user’s thoughts and intentions to move. One team, out of Case Western, is even working on a prosthetic that can provide the user with a rudimentary sense of touch. In the coming years, we hope to see continued improvement and wider availability. Ackland is, undoubtedly, a powerful model of just how much folks stand to benefit. “I do believe life changing doesn’t have to be life ending,” he told us.